Dates and booking arrangements have today been confirmed. 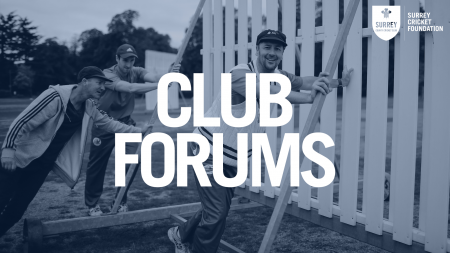 The Surrey Cricket Foundation are pleased to be able to confirm dates and booking arrangements for 2019's Club Forums - a chance for the Foundation team to get out into the county to provide development updates and meet our clubs. Taking place in February and March 2019, the evenings will look toward one of our biggest ever summers of cricket with the World Cup and Ashes on our doorstep as well as the defences of the Championship and Kia Super League. We'll be discussing what this all means for the game as well as answering any questions you may have on cricket within the county.